Sen. John Carona defends controversial HOA rule. ROCKWALL - Homeowners down on their luck and behind in their homeowners association dues continue to be threatened with foreclosure, which is legal in Texas. While state lawmakers debate proposed reforms in the law, one local state senator with HOA-industry ties says he thinks some laws should stay just as they are. There are more than 200 well kept homes and four manicured entrances at the Timber Creek Estates in Rockwall. But, beneath the veneer, an undercurrent of resentment can be found among the many who in hard economic times have fallen behind on their $300-a-year HOA dues. Neighborhood activist Amy McCorkle keeps tabs by searching courthouse records to see which of her neighbors have had a lien placed against their home for delinquent HOA dues. "On April 13, 2010, they filed liens," McCorkle said as she scanned the county's computer records. "Seven on that one day." In most cases, the property management company hired to handle the HOA business will tack on late fees, handling fees and attorney fees, putting homeowners hundreds and even thousands of dollars in debt. "I missed my homeowners association payment and within one year it went from me owning $300 to $1,300," said homeowner Nathan Neff. Another homeowner, Chris Heinen, admitted he fell behind on his dues. He said his disability keeps him unemployed, but the fees and penalties levied by the HOA's management company, Principal Management Group, keeps him in debt. you know?" he said. "It's like climbing up a sand hill. You just keep going right back down with the sand every step you take." 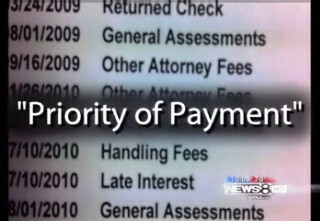 Chief among the reforms being proposed this session in Austin is a measure that would stop HOAs from forcing delinquent homeowners to repay late fees, handling fees and attorney's fees before paying their association dues. It's referred to as "priority of payment." 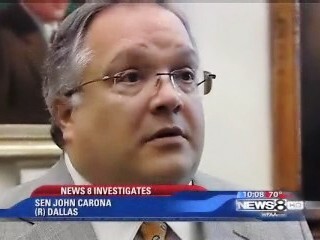 Among the defenders of the current system is Sen. John Carona, of Dallas. Carona is not only the author of many of the current HOA laws in Texas, some say he benefits most from it. 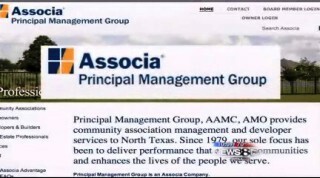 Carona owns Associa, the nations largest property management company and the parent company of Principal Management Group, which manages Timber Creek Estates. fines, fees, the filing of a lien if you are three months past due and the filing of home foreclosure after four months. Also, according to Carona's company's payment policy, the last priority of payment, number six on the list, is to be a homeowner's "regular assessments." First on the list to be paid, attorney's fees. 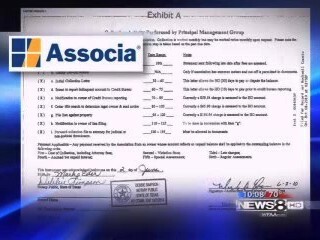 When WFAA asked, Carona denied that was his policy. He then abruptly ended the interview as WFAA attempted to show him a copy of his own policy. Carona then bolted out of the interview room and back onto the Senate floor. When WFAA tried to follow him, Carona ordered the sergeant of arms to have us removed from the chamber. Before he ended the interview, Carona said people make a conscious decision to join an HOA and should be expected to abide by the rules and regulations. foreclosures is made by each HOA board and not by his management company.